On Hosting a TV Show for the First Time and Getting to the Next Level! It’s all about timing! That’s what I learned when I hosted a TV show for the first time. Launched at the end of March 2016, “A Otro Nivel” or “To Another Level” is a Colombian reality TV program where the contestants get to sing a song of their choice while riding in an elevator. Based on their performance, the judges give them a “yes” or “no,” a decision that defines their entire journey within the show. Each positive vote allows them to go up a level. They need at least two “yes” votes in order to enter the competition. With one or zero votes, their journey is terminated right there, and they remain still in the elevator. That’s when I come in and ask them about their experience. Definitely the worst moment for the contestants. Many people have asked if I had any troubles with being on a stage, hosting a brand-new TV program with pretty much no prior experience, and the answer is…no. Thanks to my participation in the Miss Universe pageant, I was not afraid of making mistakes or being judged. You see, as Miss Universe, I traveled all around the world and visited a number of new destinations, which was a great experience and a great honor. But at the same time, all that traveling brought me to face new, never-seen realities. My comfort zone was often impacted, its boundaries were tested and, in the long term, expanded. Thanks to those experiences, the places I visited and the variety of people I interacted with, I developed the ability to improvise and deal with last-minute situations calmly and enjoying them at the same time. And that is needed in large amounts when you are in front of a camera, hosting a TV program with millions of spectators every night for four months. Was I nervous? Of course! Was it challenging? Oh yes! Was there a lot of pressure to perform? Absolutely! But I did it, and I have to thank the Miss Universe Organization for it: one year of an intense training course in improvisation and high-pressure performances. And of course, let´s not forget my great team of co-workers at the network. They made me feel comfortable with my new role as a host, giving me advice and helping me grow and learn from my mistakes. I felt truly empowered by the whole experience. Being a TV host is a tough job and I was honored, grateful and humbled that a group of people believed in me. The very first night of the program, I was feeling good about it. “A Otro Nivel” was a great chance to challenge myself with something new. My role as a host was to act as the mediator between the judges and the contestants. I had to give everyone a chance to talk at the right time or cut them off if needed. 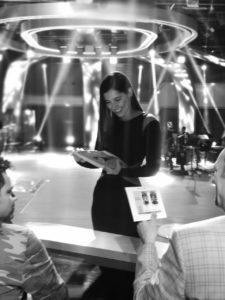 I was helping contestants feel a bit less stage fright, announcing commercials when the time was right, talking fast to close segments when we were running overtime, or chatting away and slowly to buy time when we had gaps. Timing really was everything. Additionally, I had to memorize everything as there was no teleprompter to allow me to maintain my spontaneity. And last, but certainly not least, I had to be myself. I have to say that being on a stage was a lot of fun! So many things were happening at the same time: having an excellent band playing, the super fun judges, the audience, the awesome bosses. While the director was telling me something I should add at the last minute to the script we had read earlier, someone else was putting the microphone on me, another person was fixing my hair, and another one was helping with my shoes or fixing my outfit. In the meantime, I could hear a speaker calling my name from the stage and counting the seconds until we went live. Next, I was running to the entrance, into a dark hall, trying not to fall, and exactly three seconds later, a door would open with everyone looking at me and …we were live! It was lot of pressure, but I liked that adrenaline. My rule has always been adapt and deliver, and do it quickly! Watching the live shows and living it with everyone else on stage was a true roller coaster of emotions. Not to mention the opportunity to witness the unbelievable talent of my country— I am not referring only to the contestants. A great perk for me was to be able to work with “my people” in my own country. Staying with my feet put for four months, the duration of the program, gave me a little sense of normality. It was definitely a big change from my regular schedule of activities and travels around the globe and, to be honest, it was a bit weird. Many of the contestants left a mark in my heart. Right after their exhibition, I had to be by their side and listen to the “evaluation.” I could hear them breathing fast, I could feel their nerves, their adrenaline, their fear and also their pride—many of the same emotions I was feeling myself. Overall, it was a great experience, full of energy and fun moments…and yes, mistakes, too! I wasn’t the perfect host and I still have so much to learn, but I gave my whole self to this program and to all its people. Would I do it again? Right away. Actually, you know what kind of event I would love to host? A big music event, like the Latin Grammy Awards, for example! Something thrilling and exciting, where I could feel that adrenaline kick again. After all, that has always been my ultimate goal: to keep pushing myself and thus feel alive.